Posted on Sun, Jan 2, 2011 : 3:30 p.m.
Ann Arbor Bicycle Chois members Doug Tidd, left; Tom Bartlett, center; and Cindy Blum, rehearse in the back stairwell at The Ark in Ann Arbor before a recent concert. When Dorothy Nordness heard about the Ann Arbor Bicycle Choir, she was intrigued. It was "just odd enough to sound really fun," she said. 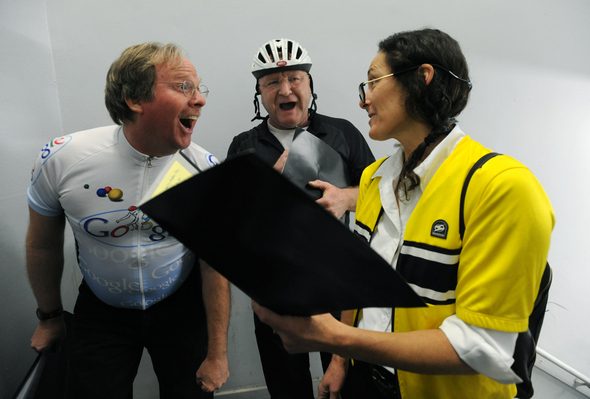 "When you tell somebody you're in a bicycle choir they raise their eyebrows and say, 'What? What do you do?'" said the Ann Arbor woman, who is an alto in the choir. Anyone is welcome to join and no formal musical training is required. The four-part choir is in particular need of tenors, but all parts could use additional voices, Nordness said. A recent performance included The Ark's 9th Annual Concert for Peace earlier this month. 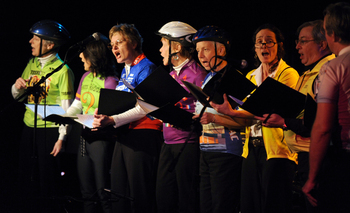 The group, donning cycling helmets and apparel, performed a song called "Mass Ride." When asked why she joined the choir, Nordness said, "Biking and singing, what else?" Lynn Babcock, an Ann Arbor resident who is also an alto in the choir, said singing while riding the conference bike, especially, is great fun and grabs attention. She said the group strives to "increase bicycle usage" as they "play a very important role in sustainable transportation." Ann Arbor resident Sue Zielinski, another alto, founded a similar bicycle choir in Toronto in the early 1990s. "I had this idea that it would be a beautiful way of communicating how the bicycle is good for cities, good for the environment," she said of the Toronto bicycle choir. Group members said Zielinski introduced the concept of a bicycle choir to Ann Arbor and former Michigan Peaceworks executive director Laura Russello helped develop it. Zielinski, managing director of SMART (Sustainable Mobility and Accessibility Research and Transformation) at the University of Michigan, said she "may have inspired" the creation of the Ann Arbor Bicycle Choir while giving a talk on transportation at a Michigan Peaceworks event in 2009. "I happened to mention the (Toronto) bike choir, I hadn't planned on it," she said. "And someone in the audience, Laura Russello, said, 'Oh my, we need one of those in Ann Arbor.'" Russello, who has since moved to Washington, D.C., said she is glad to know the choir is still intact. "I thought that was just a really fun kind of hybrid of ideas ... I think it brought a lot of people together who might not have met otherwise," she said. "I'm just really glad it's still going." The choir rehearses about once a week, but it can vary depending on what gigs are lined up. Babcock, who has done bicycle touring throughout the U.S. and abroad, said she had no formal singing training before joining the choir, but recently completed a singing course. She said many of the group members are involved in other choirs and choruses. Zielinski said many of the songs the choir sings are those she brought from the Toronto group, but with modified lyrics to make them "more American." She had difficulty choosing a favorite song the choir performs but said a few she especially likes include "Mass Ride" and "Two-Wheeled Tango," which, she says, the choir is still learning and has not yet performed. Zielinski said it's the "combination of community and purpose" that drew her to the concept of bicycle choirs. "I just love being a part of this," she said. "It can be really creative and artistic and it can also feel like it means something." For more information or to join the Ann Arbor Bicycle Choir e-mail Dorothy Nordness at dorothyk@umich.edu. Sun, Jan 2, 2011 : 5:27 p.m.